The Ohio State University College of Veterinary Medicine’s Veterinary Clinical and Professional Skills Center (VCPSC) is a state-of-the-art education and assessment resource, unique in veterinary education. The center includes almost 9000 square feet of educational space, including a large open lab, seven flexible skills labs and communications rooms, plus a devoted 3D printing space. 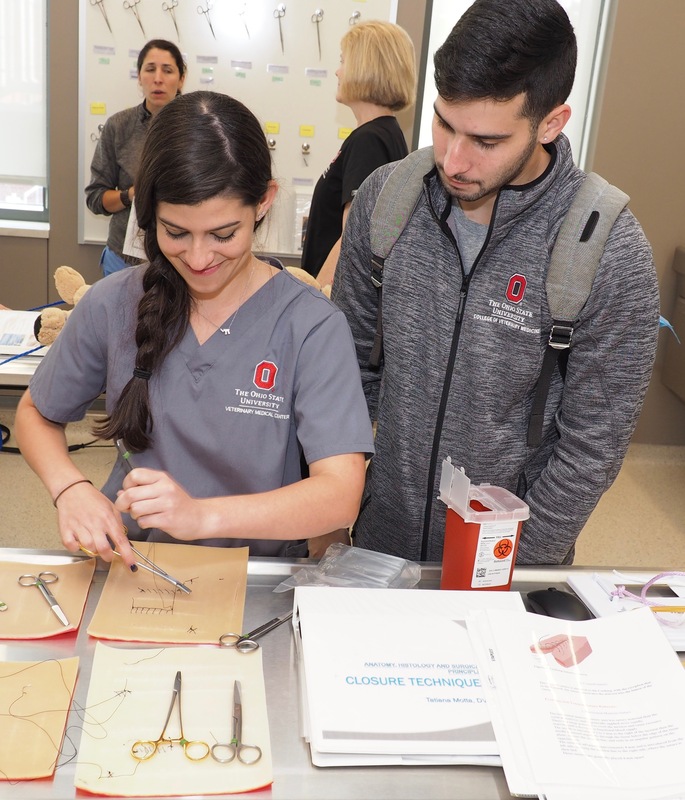 The VCPSC, together with a continuum of other learning opportunities, embodies Ohio State’s commitment to preparing more confident, competent and practice-ready veterinary graduates, equipped to provide a broad spectrum of care to animals and serve clients from diverse socioeconomic backgrounds. Combining audiovisual and lecture capture technology with high and low fidelity models and simulators, the center is a realistic training environment that imitates actual client/patient interactions. The center will enhance patient care and client satisfaction by allowing students to practice skills in this simulated environment before entering the workforce. The center is possible because of a generous gift from the Stanton Foundation. A dentistry lab with first year students was the inaugural class in the center and students were excited to start using the new space. See more photos of the first class. “I think getting to use this new facility is a great opportunity to apply the knowledge that we get in the classroom. In this modern era of education, it is not uncommon to have cool technology, but the real value is having instructors and a curriculum that can use it in an educational and applicable manner,” said Mary Pangalangan, DVM candidate, class of 2022. The College of Veterinary Medicine's Be the Model Strategic Plan outlines the college's ambition to Be the Model comprehensive college of veterinary medicine in the world. Innovations like incorporating hands on learning in the Veterinary Clinical and Professional Skills Center is one example of the college's goal to be a leader advancing education and student success. Learn more about the strategic plan and other advances at the college.